Take pealed and chopped ginger, peeled garlic and turmeric and blend into fine paste. While blending you can add oil and salt to store for longer time like more than a month in refrigerator. Crush the garlic in hand motor slightly to peel its skin easily. If u don't use Garlic then just make Ginger paste and use it for Ur recipes. 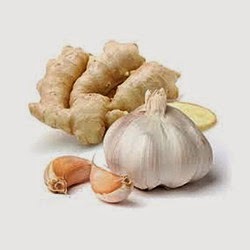 Using Ginger and Garlic paste or just Garlic paste to the curries give different flavor.